From left, Vikram Chaudhuri, Unit Head Sankara Eye Hospital, Bengaluru; Sekhar C, TVS; Mary Jennifer, Head, Vision Rehabilitation, Sankara Eye Hospital, Bengaluru; Chitra Sood, director, Business Management and Strategy, Microsoft India (R&D) Pvt. Ltd.; Dr Pushparaj, joint director, Ophthalmology, Karnataka; Dr. R.V. Ramani, founder and managing trustee, Sankara Eye Foundation, India; and Dr. Kaushik, director, and president Medical Administration, Quality & Education, Sankara Eye Foundation, India, unveiling the Maitri plaque at Sankara Eye Hospital, Bengaluru. 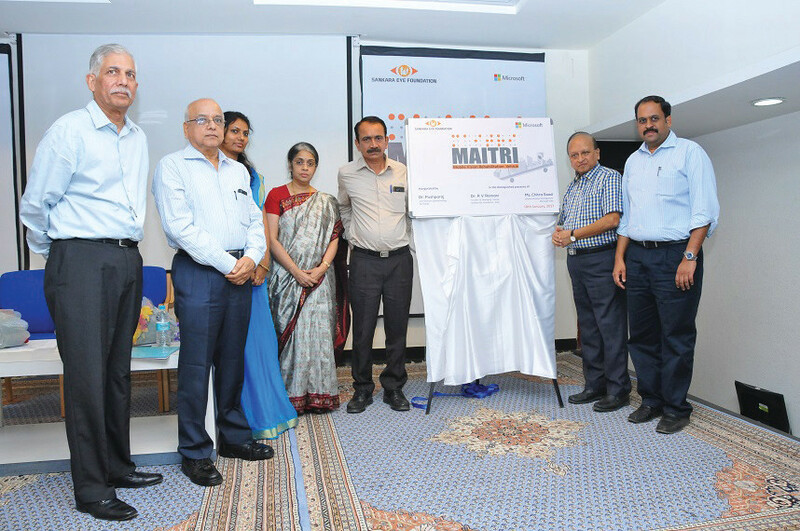 Reiterating its commitment towards eyecare, Microsoft has collaborated with Sankara Eye Hospital, Bengaluru to launch Maitri, a customized rehabilitation bus that visits remote villages in Karnataka to identify citizens suffering from vision problems and provide comprehensive rehabilitation services. With less than 30 percent of patients receiving rehabilitation services, Maitri was conceptualized to provide services to visually impaired patients at their doorstep, helping them become independent and improve their quality of life, a Sankara Foundation press release said. Microsoft has contributed funding to build and launch the bus under. A pilot undertaken at Hoskote Village, the Maitri team screened over 130 citizens for vision issues in the past few months. More than 30 trainings for visually challenged individuals have been conducted in the mobile rehabilitation facility. So far, Maitri has concluded 32 visits across Hoskote and 54 patients having been taught skills ranging from the use of assistive devices, computer literacy, and even home skills like using a stove and functions in a kitchen, the release said. Speaking during the launch Dr. R.V. Ramani, founder and managing trustee, Sankara Eye Foundation said Maitri is model of how a caring corporate, a dedicated organization, and the government can work together to help over 500 visually impaired individuals from rural communities gain independence annually. The Sankara Eye Foundation has its presence across eight states and total bed strength of 1800. Till date more than 1.4 million free vision restoration surgeries have been performed across Sankara.